Hang onto your hats everyone, here we go … The Volcanic Ash Encounter is the last remaining bastion of the major NNM exercise in the 777. Enjoy it while you can folks – in the 787 the AP remains engaged for Dual Eng Fail/Stall and in the event of Unreliable Airspeed, a flick of a switch restores the Airspeed based on angle of attack to an accuracy of something like 5 knots. • Reversion to Left PFD/ND/Upper EICAS with all other screens failed – if both engines fail. The RAT returns the Right PFD/ND; the APU brings with it the lower MFD. Nothing returns where you were up to in the ECL, you’re starting both the NM and the NNM checklists from scratch. Anyway – this single event incorporates a host of NNM Management Procedures, Techniques and Axioms, often in conflict with each other. Each time you run this in the simulator, the basic scenario manifests differently, and even to the same scenario – crew respond differently much of the time, more often than not correctly in their own respect. But after a while you realise the same questions come out time and time again, and some crew have better management techniques that we can all learn from. As always – this is a techniques discussion firmly rooted in (hopefully) common sense and airmanship, but also a lot of experience watching and doing this in the simulator – and absolutely no actual experience in real life. 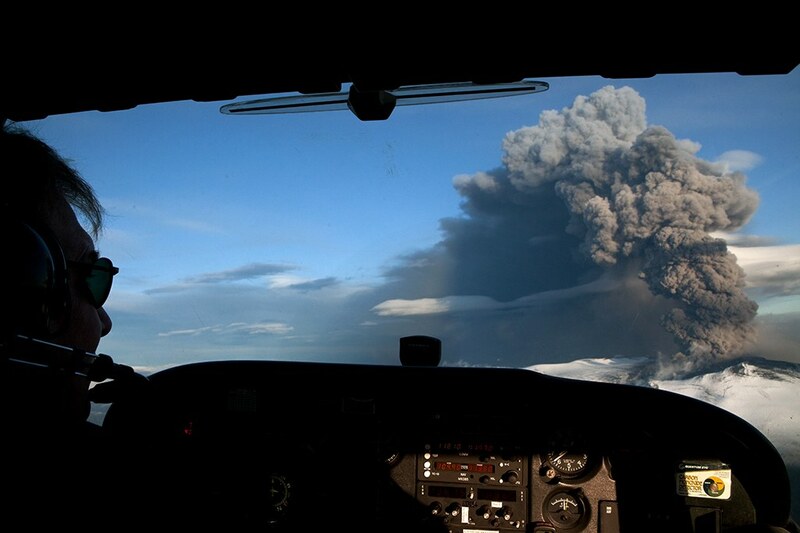 While I’ve spoken at length to Eric Moody, I’m still waiting for my first real Volcanic Ash encounter – and I spend a fair amount of effort in pre-flight and in-flight doing my best to avoid it. Without spending time talking about what you already know – suffice to say flying in Ash is bad, and your first voluntary action should be to get out of it and protect your engines. This requires (a) a Descent; and usually (b) a Turn. So now you’re turning in HDG / TRK SEL – AP engaged ideally – and Descending with Idle Thrust in FLCH SPD. With any luck, you get away without losing both your engines, retain your airspeed indications, and you’re left with (probably) at least one malfunctioning engine, and an un-annunciated Volcanic Ash Checklist to do. I personally have a terrible habit of reaching up and starting the APU in all of this – a bad technique that so far no-one has managed to train me out of – but as always, I’m hopeful of self-improvement. Then … Dual Eng Fail Stall – or is it? At least, that was your plan. In the sim, things happen a little quicker than you’d like – or recognition takes longer than you’d planned – and if you haven’t commenced a descent, you’ve got one or both engines rolling back. That leads you into the Dual Eng Fail/Stall Memory Items. I personally consider the Airspeed and APU as part of the memory items, but that’s technique. If you have commenced a descent – congratulations, while you were hoping to protect your engines, you’ve probably also disguised the Dual Eng Fail/Stall occurrence. They may not be both failed as you descend in Idle – but they could well be both Stalled near Idle. If you want to test this, you can (in HOLD) push each thrust lever up one at a time to see if you’re getting a response. If you have one engine, then you can continue down secure in the knowledge that you’ll be able to level off when you want to (maybe). If not – you need to get onto the Dual Eng Fail/Stall Memory Items. If the APU is running at this point, it’s all sweet – if not, you’re about to lose all the screens except yours when you cycle the Fuel Control Switches … Cutoff/Run. I say “yours” because if as the Captain you’re not already flying, you soon will be when the right PFD/ND disappear, including the ECL and whatever progress you’ve made through the outstanding NNM checklists when the engines are cycled. Note – I’m NOT saying to delay the Memory Items while you wait for the APU. A quick word on Management. With my Captain hat on – I’m pretty confident in my ability to “Manage” most NNMs, as well as my ability to do things like selecting and implementing a preferred flight path, choosing between different memory Items, telling ATC what I want (no requesting at this point), considering conflicting checklists, including the Cabin into the equation as soon as I’m able, Aviate/Navigate/Communicate, Assessor/Action/Manager and generally FORDECing the stuffing out of this day. Right up until the point where I’m trying to do any of this while hand flying a 777 glider on raw data, no engines and bad airspeed. Therefore – in this scenario, my standard response is to get the aircraft into the safest immediate state that I can – Fly The Plane, Descent (Idle), Turned (Away), Memory Items (if necessary, done) – then hand it over and get on with my real job. All of a sudden, the workload of flying is gone, I have 90% of my brain released from the task of flying (some would say more) and my capacity to deal is increased significantly. At this point as the PM/Captain, the most common mistake is to sacrifice Monitoring against Management and leave your other Pilot to deal with it all. Don’t forget to Monitor – especially if the scenario does transfer to Manual Flight and Unreliable Airspeed (and the requirement to recognise it) as is a likely consequence. Obviously, one or both of your engines will return and you’re headed off to whichever airport is nearest/suitable. How do I know this? – 20 years of simulator exercises, that’s how I know. But if you want to allow for the possibility of NOT getting your engines back – then I suggest getting your Cabin Leader into the scenario slightly before the “Brace Brace” call at 500 feet. Know how you’re going to get her/him into the flight deck asap; exactly what you’re going to say – while managing/flying/breathing. The Question Is – Which Checklist? 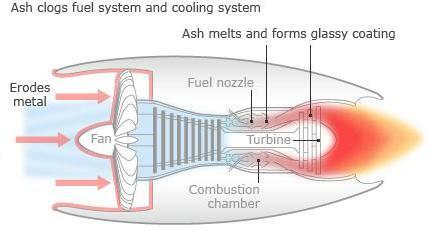 So, when you’re just into the Volcanic Ash checklist and you lose both engines – what do you do? Dual Eng Fail/Stall Memory Items of course. With those out the way (how easy was that) – now you need to decide what checklist to do now. 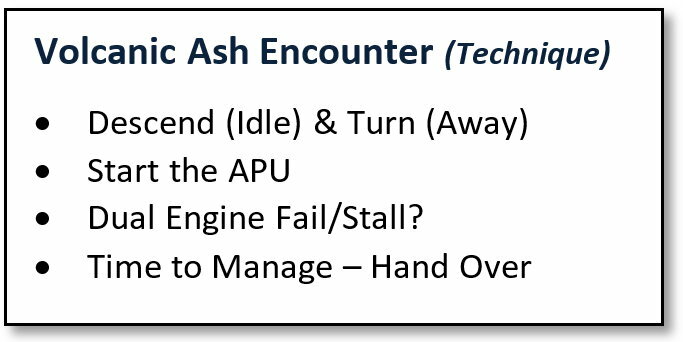 The likely choices are to continue the Volcanic Ash Checklist, or run the Dual Eng Fail/Stall Checklist. Which one are you going to run – considering that they are both un-annunciated and so EICAS does not offer any direction here. First principles suggest that the checklist with the Memory Items could be considered a higher priority than a checklist that does not have them, and that’s an entirely defensible position. That leads to Dual Eng Fail/Stall. 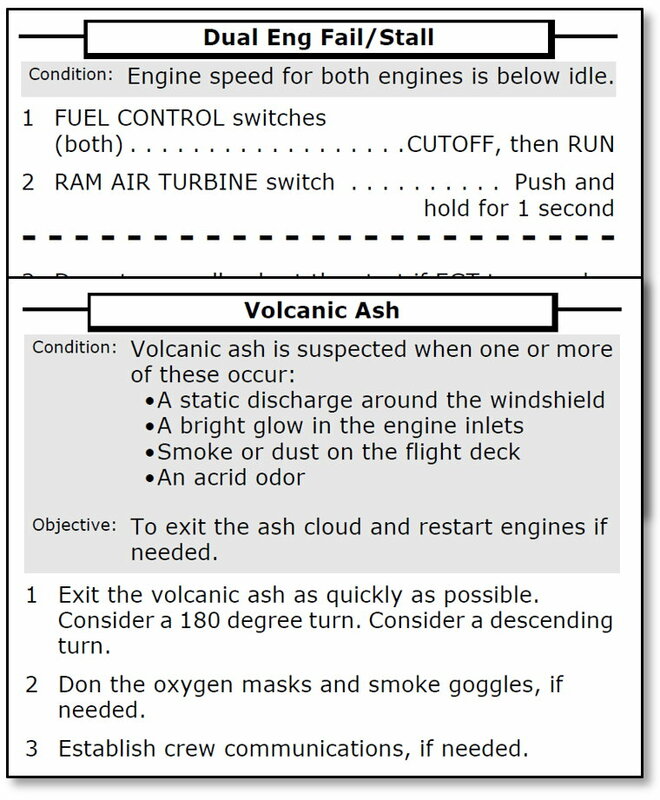 If you know your checklists, you also know that all the elements of the Dual Eng Fail/Stall checklist are (currently) contained within the Volcanic Ash Checklist (and a few more, since the Volcanic Ash deals with not just the engine problem(s) but also … you know, the Volcanic Ash). 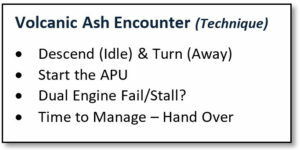 So, while procedurally the correct response is probably to run Dual Eng Fail/Stall Checklist, I’d like to believe that continuing the Volcanic Ash Checklist instead is a forgivable sin. 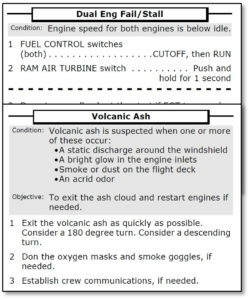 Either way – you’re going to end up running the Volcanic Ash Checklist at one point or another anyway, even if it’s after you’ve completed the Dual Engine Fail/Stall Checklist. Sorry – did you want a clear answer to this question? or the  Eng Svr Damage/Sep checklist (via the Memory Items) and a secured engine. All of these checklists will also sort out TCAS TA; Flap 20/30 other Engine NNM considerations.